The supermarket where the robbery occured. 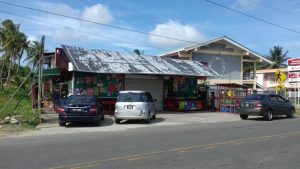 A 26-year-old businessman of East Canje, Berbice was relieved of a quantity of phone cards and local currency by two masked bandits who stormed his home on Wednesday evening. Deputy Commander of the Berbice Division Mr. Edmond Cooper said four persons have since been arrested to assist with investigations. The man, Zhou Chunmin, who operates a supermarket in the lower flat of his home located at lot 109 No. 2 village, East Canje, had finished securing his place of business moment before the bandits struck. According to information received, Chunmin was about to enter his home when he was struck in the head by one of the bandits resulting in him recieving injuries to his head. He was then forced to the lower flat into a store room. One of the suspects, who brandished a cutlass, threatned to shoot him and then ordered him to hand over cash and valuables. The bandits removed a bag containing more than GYD$200,000 on cash and GTD$100,000 in phone cards and made good their escape. The businessman, who resides with his uncle in the upper flat, refused to comment on the incident.